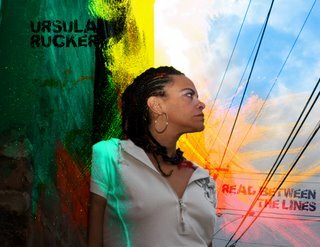 After a 2 year hiatus from recording Ursula Rucker is back to let everyone know she is still the queen of the Spoken Word scene. Having recorded with just about everyone from 4-Hero to Josh Wink, toured the world to sold out audiences and making appearances on Russel Simmon’s Def Poetry Jam, Ursula has remained in the spotlight. Read Between the Lines is the first single from the highly anticipated "Ruckus SoundSysdom". She continues to make her listeners think and question what life is about. Produced by King Britt, this slice of raw energy has been getting early support from the likes of Gilles Peterson (BBC Radio 1), Kevin Beadle, Laurent Garnier, Francois K. and mondomedeusah creative. Ursula will be touring this Fall to promote the album. 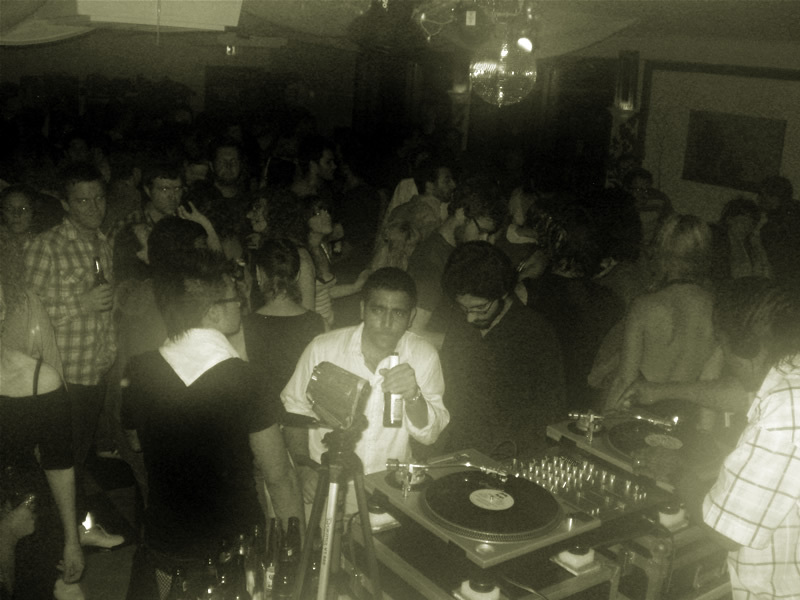 Look for some dates with King Britt’s Sylk130 collective. Raid Projects Los Angeles is offering one of two bedrooms and a studio for artists to come to Los Angeles, make new work, network with commercial galleries and curators, and explore Los Angeles at a rate of $1000 US per month (The AIR program will rise in cost for 2009 to $1200 US). The following dates are still available for the 2008 and 2009 Program: December 2008 - January 2009- February 2009, January 2009 - February 2009 - March 2009, March 2009 - April 2009 - May 2009. For periods of 3 or 6 months residents are provided with living accommodation and a studio. During the residency Raid encourages the artist to bring curators, critics and collectors to visit the studio and see the produced work privately. AIR resident artists are predominantly international, but we also host US artists whose projects are suitable to a LA residency. The residency fee from April 2008 is $1000 US per month. This will NOT culminate with an exhibition after this date. The residency will entirely concentrate on the artists experimentation and experience of Los Angeles without the pressure of a final outcome. 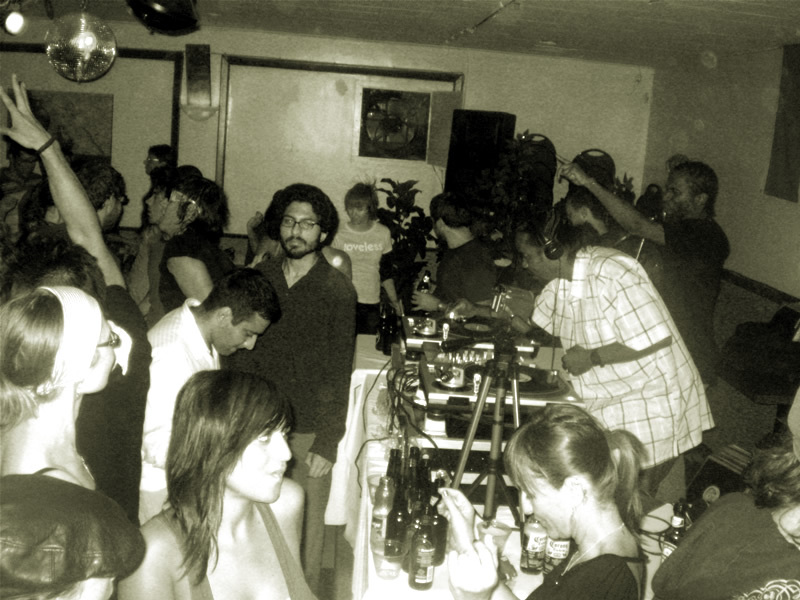 This residency will be for the artist to choose to spend their time wherever they feel it will do them the most good. There is a space dedicated to displaying work for any visits by curators, critics, etc but will not act as a show or host an opening. Please note, upon acceptance into the program, it is up to the artist to secure their space by providing a non-refundable deposit of the first months rent ($1000US). This is the only way to cement the dates you wish to have. The AIR program will rise in cost for 2009 to $1200 US to reflect increases in rent as well as the decline in value of the US dollar. 1. Gallery Hopping: Shortly after their arrival the artist will be encouraged to visit the many galleries, opening receptions and arts events happening every week. 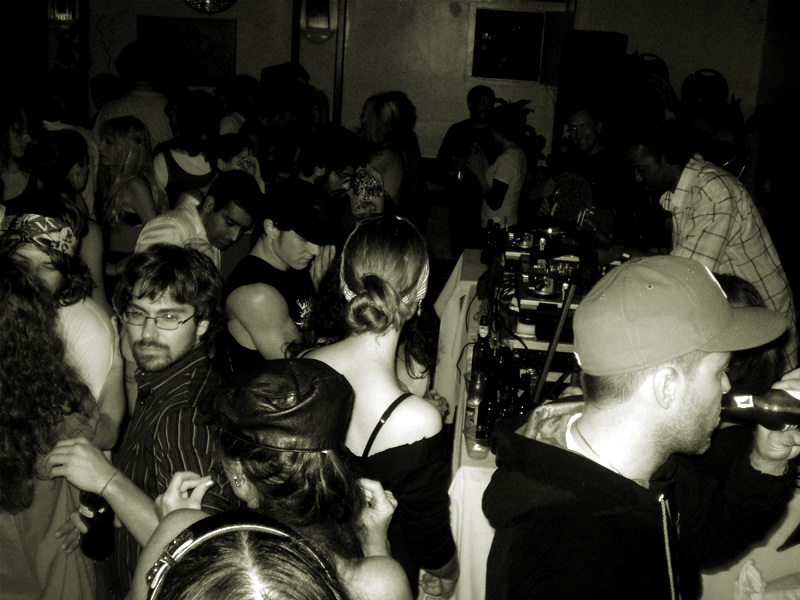 This is a great way to meet people in the LA art scene. 2. 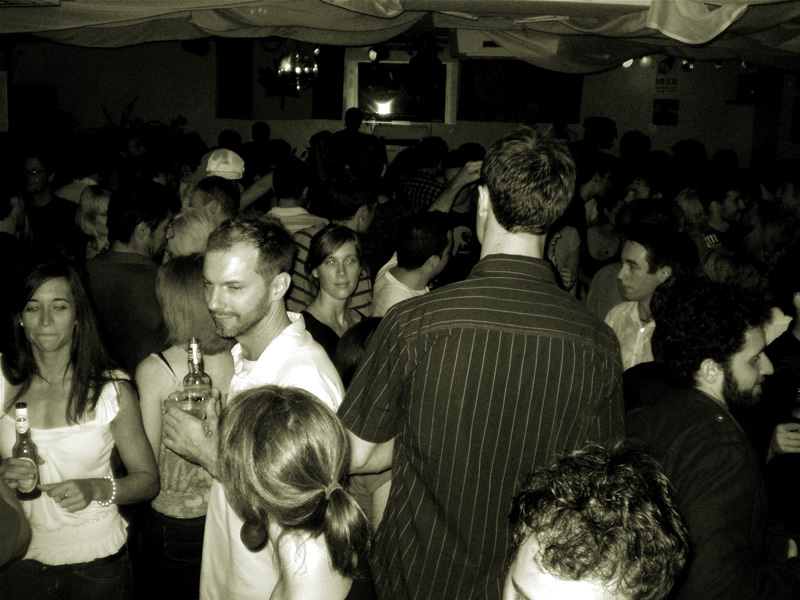 Getting Started: Raid does not provide artists with materials for their projects. However, there are tools at Raid and the artist is more than welcome to use them, but types and availabilities will vary from time to time. And on the subject of tools, Home Depot is just down the street. 3. Analysis: Upon the artist's request, to engage in a comprehensive critique with the gallery director before the artist completes their residency. Andy Warhol - one of the most influential American artists of the twentieth century - captured the likeness of some of the most visionary and powerful political leaders of the 20th century. Images of John F. Kennedy, Jimmy Carter, Ronald Reagan, Queen Elizabeth II, and Mao Zedong, among others will hang side-by-side when the Currier Museum of Art presents Andy Warhol: Pop Politics from September 27, 2008 through January 4, 2009. Pop Politics displays together for the first time more than sixty of Warhol's paintings, prints, drawings, and photographs of political figures. His portraits of American presidents and presidential candidates, queens, Communist dictators, and other political figures reveal intriguing, yet until now unexplored insights into Warhol's own celebrity status and political leanings. Warhol's images of these powerful personalities comment on the interrelationships between politics and celebrity culture in the late twentieth century - connections that remain ever present today. Timed to coincide with the 2008 presidential election, this exhibition offers a probing and entertaining look through the eyes of America's most famous Pop artist at the leaders who shaped the twentieth century. 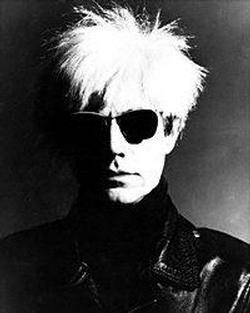 Warhol (1928-1987) rose to fame in the 1960s and became synonymous with Pop art and American culture of the period. He played upon the increased bombardment of advertising and media images to develop a signature style that employed commercial subjects rendered in bold, graphic designs and colors using mass production processes. In capturing the rebellious spirit of the time through his work and personality, Warhol created a body of work that transformed our understanding of art by blurring the boundaries between art and popular culture and shaped a new aesthetic that came to symbolize the counterculture. His now iconic work has influenced subsequent generations of artists and continues to resonate with audiences today, both young and old. Building upon a long history of political portraiture dating back to Egyptian pharaohs, Roman emperors, and European monarchs, Warhol pictured twentieth-century politicians in his graphic style which likened them to commercial products like Campbell's soup and Coca-Cola. In so doing, Warhol connected his images of these leaders to America's fascination and consumption of all aspects of contemporary culture. His portraits are not just records of the individuals; they also position the leaders within the context of cultural taste and political values. A dedicated portraitist, Warhol captured the likeness of an astonishing number of individuals including those of friends, artists, actors, athletes, and world leaders. His depictions of John F. Kennedy, Mao Zedong, Queen Elizabeth II, and others were derived from widely circulated official or media photographs. Warhol's appropriation of these stock images signaled his interest in how political leaders ascended to celebrity status as a result of their constant representation in the media. The exhibition highlights Warhol's fascination with America's "royal family" - the Kennedys - through his images of President John F. and Jackie Kennedy and Senators Robert and Edward Kennedy. Struck by the media coverage of President Kennedy's assassination, Warhol created a series of works based on news images of Jackie, both as glamorous First Lady and as grieving wife. Seven of these paintings will be shown alongside rare preparatory studies. The exhibition features a recent Currier acquisition: Flash ˆ November 22, 1963 Produced five years after the assassination and exhibited now at the forty-fifth anniversary of the tragic event, this print portfolio includes eleven screenprints based on related news images including the book depository, Lee Harvey Oswald, and President Kennedy's campaign poster˜making it the only work by Warhol to depict the President. It also reproduces the teletype text from the four days between the President's assassination and funeral, with the sheets bound like a book. Accompanied by archival materials and unique trial proofs related to this project, another major highlight is a one-of-a-kind, never-before exhibited screenprint of Senator Robert Kennedy that Warhol did not include in the final edition of the Flash portfolio. Also featured are excerpts from a 1965 reenactment of the assassination filmed in Warhol's New York City loft known as The Factory. These works are shown for the first time alongside Warhol's 1980 portraits of Senator Edward Kennedy. In addition to selecting certain leaders as his subjects, Warhol was also commissioned by political hopefuls such as Edward Kennedy and Jimmy Carter. Their patronage of Warhol was intended to help position them as contemporary and progressive. That these projects - like his print "Vote McGovern" featuring a green-faced Richard Nixon created to support George McGovern's presidential campaign against the incumbent - were produced to raise funds for candidates' presidential campaigns, illuminates an active, even if veiled, political agenda by Warhol, who claimed he only voted once. Warhol's elevated status in American society also gave him entrée into the world of politics including invitations to governors' mansions and state dinners at the White House. The exhibition highlights these portrait commissions through photographs, drawings, prints, and paintings of each subject. Central to the exhibition's focus is Warhol's process for creating his portraits. The artist was more directly involved with his portrait commissions than with any other works. Rather than manipulating images he found in mass media outlets, Warhol began his commissions by taking dozens of Polaroid images of his subject. After selecting one or more of these photographs, Warhol transformed the sitter's likeness into his signature style, often first producing drawings and then prints and paintings. This exhibition presents these Polaroids alongside related works of a single subject, capturing Warhol's process as well as the repetition of images that became a hallmark of his work This repeated image is further underscored with the inclusion of a large section of Mao wallpaper that the artist created for a gallery presentation of his work in 1974. Ever the multimedia artist, Warhol also produced and directed films and created his own television shows. These projects helped shape his presence in American culture. The exhibition also includes excerpts from several of Warhol's film and television programs that include political content: Since (1965), The Life of Juanita Castro (1965), Afternoon (1965), and an episode of Andy Warhol's TV featuring an interview with New York Senator Daniel Patrick Moynihan (1983). Throughout the exhibition, works are accompanied by rarely seen archival materials from Warhol's "time capsules." Beginning in 1974, Warhol collected papers, photographs, correspondence, business records, and other objects in cardboard boxes, amassing over six hundred boxes by his death. Highlights relating to the exhibition include a solicitation from President-Elect Nixon for recommendations for his administration, an invitation to Nixon's inauguration, a signed letter from Senator Robert Kennedy expressing his thanks for Warhol's support, and a handwritten note from First Lady Nancy Reagan. These materials yield new insights into Warhol's connection to the political celebrities he portrayed and how those relationships extended beyond his portraits of them. Andy Warhol: Pop Politics will be accompanied by a full schedule of educational programming. The museum shop will feature Warhol-related merchandise and the Winter Garden Café will have new, themed items on the menu. Visit wwwcurrier.org for more details as they become available. Andy Warhol: Pop Politics is organized by the Currier Museum of Art, Manchester, NH. The exhibition is sponsored in part by Public Service Company of New Hampshire with additional support from the NBT Charitable Trust and the Badger Fund of the New Hampshire Charitable Foundation. Media sponsor is WZID, 95.7FM. 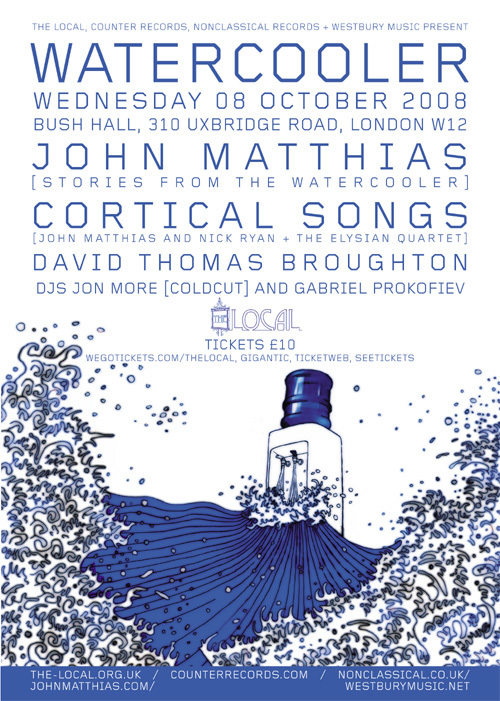 John Matthias album "Stories from the Watercooler" (released on Ninja Tune affiliate Counter Records ). "Stories From The Watercooler" is a suite of twelve short stories rendered in song form. 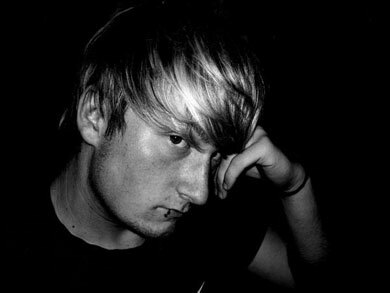 Their basic template is classic folk-rock - great song-writing, acoustic and electric guitar, strings. But within this seemingly simple formula John writes about everything from the shooting of Jean Charles De Menezes, to fake alternative therapies, credit ratings and telephone banking, from boxing to Japanese internment camps in California and bombs with the face of Britney Spears painted on. This is clever, emotional, unfashionable music-making - it's not about John Matthias, it's not about the trials and tribulations of celebrity or non-celebrity. It's about the everyday and the unusual, about how people relate or fail to relate. A kind of folk music for a new millenium, it's about life and the world. Cortical Songs is a work in four movements for string ensemble and solo violin written by John Matthias and Nick Ryan in which the orchestra is partially controlled by a tiny computer brain. Its beautiful and strange. 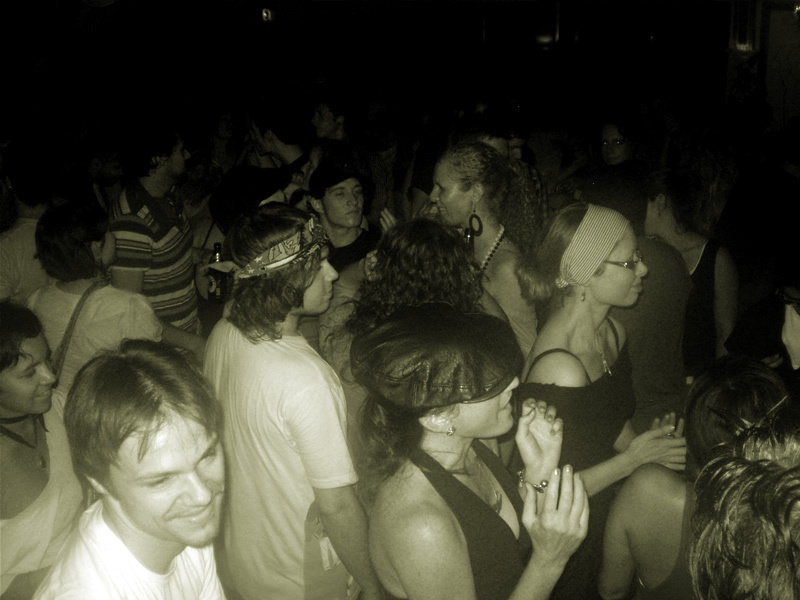 deep space :: no dress code just an open mind.